The ultimate goal of most cryptocurrencies (Bitcoin first and foremost) is to undermine the banking industry, via decentralization; providing a route of payment and store of value that negates the need for banks and their various middlemen. However, there are also some cryptocurrencies, alongside their parent companies, that aim to better the banking sector; providing them with an antidote for the legacy systems of old, and paving a way forward for these entrenched financial institutions. One of those companies is Stellar, followed in toe by its blockchain and native token XLM. Stellar has, for since its iteration been at the forefront, pioneering remittance solutions for these institutions and banking many partnerships along the way. Why is XLM on the rise? Back in September last year the IT monolith IBM, launched "World Wire", a blockchain based payments system using the Stellar network to settle and clear cross border payments, using digital currency. In the month following the news XLM climbed a massive 39%. What does World Wire actually do? Simply put the payment system works much the same as any other peer to peer crypto transaction except on a much grander scale. In order to use World Wire transacting institutions must agree on a transfer currency, also known as a “bridge currency.” under World Wire these options include either a stablecoin issued by IBM, or a cryptocurrency (including XLM). Institution A (The sender) will convert their fiat currency using World Wire’s API into an agreed upon digital asset, World Wire will then convert the digital asset into the corresponding fiat currency of institution B (the receiver) all of which is recorded onto the Stellar blockchain. So far, six international banks have signed letters of intent to use World Wire, including, Philippines-based RCBC, Brazil's Banco Bradesco, and Bank Busan of South Korea. How could this help the banking industry? At present, SWIFT dominates the cross border payments sector and that is SWFIT (you may have heard of it) aka The Society of Worldwide Interbank Financial Telecommunication. The system runs on a network of tens of thousands of financial institutions worldwide; notifying banks on over $5 trillion of transactions per day. Effectively Swift is a glorified messaging system, enabling financial institutions around the globe to send and receive information on transactions. However, SWIFT doesn’t actually send money, effectively it’s a glorified messaging system, enabling financial institutions around the globe to send and receive information on transactions, slowly…. and usually with a hefty fee. Essentially SWIFT is about as useful as sending a text you friend notifying them that you about send $10 to their account. Sure, they have a record of the ‘transaction’ that will take place, but no actual money has been sent; on top of this, that text message incurred a network fee… That is SWIFT. And so this begs the question, why use SWIFT? This is why blockchain solutions are gearing up to overtake SWIFT. Solutions, such as Stellar and IBM’s joint venture WorldWire, as well as Ripple, look too take advantage of the immutability and speed of blockchain coupled with the liquidity and low fees of cryptocurrencies to offer an all in one solution for payments. What does World Wire mean for Ripple? Ripple and Stellar have been competitors for a while, in fact, Stellar is actually a quasi offshoot of Ripple, created by one of ripples co-founders Jed McCaleb. However, over the years this philosophical vision has morphed more and more in line with that of Ripple, with aims to transform the way banks interact with each other, rather than simply banking the unbanked. So could stellar challenge Ripple? Stellar, backed by IBM, now stands as a huge contender against Ripple, with an estimate 30-40 banks expected to be utilizing World Wire. However, in comparison Ripple are said to have around 200 client banks using their payments services, including banking giant Santander. So while Stellar and IBM pose a threat, it seems as if they still have some catching up to do. However, with up to 40 banks already signed up out of the gate, World Wire may still prove a worthy contestant. Read more: The true value of XRP's market cap; Why do some people hate Ripple (XRP) so much? 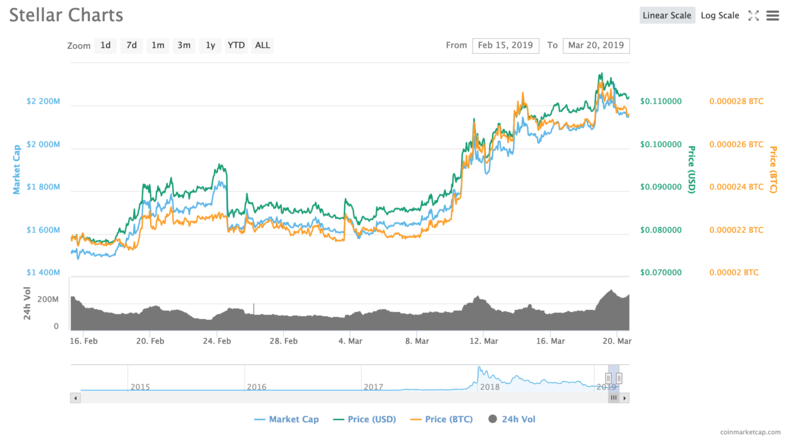 ; Why is Stellar (XLM) more than 10% up today? Its rise is very simple Coinbase just started to pump XLM. As nice as all these BIG partnerships are, it is all meaningless if they aren't going to use the "coins." All they are using is the blockchain technology. I hold xrp, xlm, trx, btt, bch, btc, ven, bnb and qtum. So as much as it is nice to hear about all these great partnerships, we are all just bag holders of hope and wishful future of a great technology.